Stephen Elam – In December, my wife, Penny, and I had our third child, Abraham. In March he had heart surgery and is doing well. I still work at Lynchburg College in Virginia in its Doctor of Physical Therapy program. I am now working on a Doctor of Education (EdD) with a specialization in Leadership Studies. Bruce White – I recently became the vice president of business development at Fyzical Therapy and Balance Centers in Lake Worth, Florida. I’m grateful for the opportunity to work with private practitioners all over the country to enhance their success and to help them achieve their business goals. J. Haxby Abbott – I’m back in New Zealand doing full-time research at the University of Otago. I also recently co-published an article in the Journal of Clinical Epidemiology (2014) to examine the validity of the Patient-Specific Functional Scale (PSFS) for the assessment of grouplevel change and between-group discrimination in group-level data. Tiffany Hilton – I accepted a position as an associate professor at Duke University School of Medicine in Durham, North Carolina, in the physical therapy division. I teach the applied physiology courses and continue my research, which is currently focused on optimizing function in elderly individuals who have experienced a disabling medical event, such as a hip fracture. Mark Bresee – I recently celebrated the seven-year anniversary of the private practice I founded. I also recently passed orthopaedic specialist certification. I remain busy with my wife, Ellen, and our three children. We couldn’t be happier. Geordie Griener – I never left St. Augustine area after graduating! I married my wife Amanda Poole Griener after she graduated one year after me. We have an 18-year-old daughter and a 9-year-old son, and we both work in outpatient rehab. Sherri Lorraine – I am the director of pelvic health and physical therapy at Zipper Urogynecology in Melbourne and Vero Beach, Florida, and I also own and run a Women’s Health Physical Therapy clinic. I also have an American Physical Therapy Association Board Certification. Bill O’Grady – I was awarded the Paris Distinguished Service Award from the orthopaedic section of the American Physical Therapy Association (APTA), the APTA’s Catherine Worthingham Fellow, and honored as a distinguished alum in 2014 by the University of Southern California. I continue to teach at the University of Nevada, Las Vegas. Paul Vidal – I am coming up on 10 years in private practice. By combining my specialties of manual therapy and vestibular rehabilitation, I have been at the forefront of postconcussion rehabilitation. I have been an invited speaker on the topic of post-concussion rehabilitation and published a paper in Pediatric Annals. Phil Coppa – I am traveling the world with my wife and children! We are currently on an island in the South Pacific where there is a shortage of medical professionals. I provide home health, pediatric, and outpatient orthopaedic services. I am also a consultant for the local hospital systems. Karla Gowan – I recently passed the inaugural Pelvic Rehabilitation Practitioner Certification exam through the Herman & Wallace Pelvic Rehabilitation Institute. I work in a small hospital in eastern Washington State where I have started a women’s pelvic health program. Kyle Guidry – I have been married for more than 10 years to Sue Ann Scott Guidry, who is a 2002 USA graduate. We have four children. We opened Guidry Physical Therapy in Surprise, Arizona, in 2012. Nirtal Shah – I have created a free physical therapy application called myAnkle to objectively measure standing balance. The app is available for Android mobile devices in the Google Play Store. Jennifer Flage Hobson – I am excited to say that I will be teaching CFC courses at USA with Mark Strickland in 2015. We have been training to teach with Dr. Mariano Rocabado for the past two years and it is finally happening. I continue to treat mainly head and neck/spine patients at my clinics in Chicago and Hinsdale, Illinois. I have recently been trained in myofunctional therapy and am involved in treating airway and sleep apnea as well. Lisa Houck – Since graduation, I have successfully balanced having a family and working full time for Integrity Rehab Group, where I currently run two successful outpatient clinics in Maryland. John (Jay) Lamble – I am a clinical specialist at St. Francis Hospital in Evanston, Illinois, and the CCCE. I love having students and being involved in clinical research. Joshua Davis – I am now a partner at First Step Physical Therapy in Fayetteville, Georgia. We specialize in outpatient neurological rehabilitation. My wife, Laura, and I were blessed with the birth of our son, William, in March. Jeff Loveland – I received a Roster of Fellows Award from the American Occupational Therapy Association at its annual conference in Baltimore in April. I was recognized for my contributions to professional development in education and practice. I recently retired as the founding occupational therapy program director after 17 years of service at James Madison University in Harrisonburg, Virginia. Wendy Smith – I have made the jump to home health after 20 years in a hospital-based outpatient setting. I love the freedom of choosing my own hours and not feeling rushed to get to the next patient. Cortney Fowles – I am currently working for an outpatient physical therapy clinic in Barrington, Illinois. I specialize in orthopedics, sports medicine, and vestibular conditions. Alisha Jarreau – I am the new owner of the Therapy Center for physical rehabilitation and wellness in New Roads, Louisiana. I live in Lakeland with my wonderful husband of nine years and two children, who are 5 and 3 years old. Sue Machtley – We welcomed our new baby boy, Marco Elias Machtley, in June. I will return to my private physical therapy practice this fall. Marc Oceguera – I’m the physical therapist for the Atlanta Braves. Redha Dashti – I was appointed chairperson of physiotherapy department at Ahlia University in Bahrain in 2013. I also work as the head of the neurological rehabilitation unit in my own private clinic. Michelle Layton – I co-presented on the subject of dry needling at the American Academy of Orthopaedic Manual Physical Therapists (AAOMPT) conference in October. I also recently passed my exam through the Physical Therapy Board of Craniofacial and Cervical Therapeutics and am now a certified cervical and temporomandibular therapist (CCTT). Mandee (Massay) Kleine – I recently accepted a position as clinic director of an outpatient physical therapy facility in Fort Mill, South Carolina. I also recently published my first book, I Met Him Online. Really. (CreateSpace, 2014). Stephanie Capshaw – At the start of the year I accepted a position as an occupational therapist at the renowned STAR Center and as the director of education at the SPD Foundation in Colorado. Adam Guiliano – Three years ago I started the company InMotion Physical Therapy in southwest Florida. I now have contracts with outpatient facilities, an in-patient drug treatment center, home health companies, including workers comp and hospice, and serve as head clinician for a CrossFit gym. Peter Sprague – I received the Golden Apple Award for Professor of the Year in the College of Osteopathic Medicine at Nova Southeastern University in Florida, where I’ve worked for more than nine years. I’m first author on the article “Changes in Functional Movement Screen Scores Over a Season in Collegiate Soccer and Volleyball Athletes” published in the Journal of Strength & Conditioning Research (2014). Wendy Archibald – I live in Phoenix, Arizona, with my husband and have obtained certifications in lymphedema and Kinesio Taping. I am currently working toward becoming a certified hand therapist. Adrian Baker – Professionally, I have continued to work at the same private outpatient clinic where I see all types of patients. My focus, however, is postural restoration and pediatrics, which is why I became a Postural Restoration Certified (PRC) therapist. Personally, Jason and I welcomed our second baby boy, Beau Thomas Baker, in April. We are so in love. Eileen Chisholm – I’m currently using my dual degree as the director of physical therapy at River Parishes Hospital in LaPlace, Louisiana. I work with physical and occupational therapy patients in acute care and in outpatient settings. 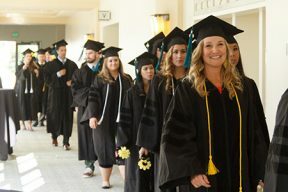 Katie Cushanick – I graduated from the University of Vermont College of Medicine and will spend the next three years completing a pediatric residency at the Nemours/Alfred I. Dupont Hospital for Children in Wilmington, Delaware. Paul Fitzgerald – I launched a multidisciplinary, web-based telehealth services company. MyTherapyConsult.com is an alliance of highly educated and experienced clinical specialists who are dedicated to changing the landscape of healthcare by offering an affordable option to all who seek it. The company also promotes and supports existing brick-and-mortar businesses. Victoria Ross – Since graduating, I have lived in Georgia and Utah, and currently live in Arizona. I work for the Department of Defense as a physical therapist treating active-duty military members. My specialties include manipulation, dry needling, tactical rehabilitation, sports medicine, and headache treatments. I love my job. I am married to an amazing, supportive husband. We have a 3-year-old daughter and a 2-year-old son. Leigh and Mike Scarber – We live in Ventura, California, and are expecting our first baby! Mike is a rehab director and Leigh works in an in-patient/out-patient rehab and recently obtained her Geriatric Clinical Specialist certification. Terry Shepherd – I am the president and owner of two multidisciplinary clinics in Brevard County. I am certified in an array of techniques, including laser therapy, manual therapy, aquatics and sports nutrition. Tammi Stewart – I got married in May and am working full time for a hospital-based outpatient clinic in Washington State. I have taken up soccer and snowboarding! Go Seattle Sounders! Steven Sudell – I am currently living in Santa Monica, California, and recently opened my own outpatient clinic called Venice Sports Physical Therapy where I primarily treat CrossFit athletes. In October, I married USA OT graduate Lindsay Stoddard. Jeffrey Wencel – I work in Joliet, Illinois, in an outpatient setting. I’m currently enrolled in the DHSc program at the University of Indianapolis with a concentration in orthopedics. Tia Powell – I have worked as a physical therapist in Virginia for three years and was recently promoted to center manager. I married my husband in October. Kamal Mody – I continue to build my private practice, Sandalwood Rehabilitation and Ergonomics, in Ocala, Florida. Last year, I resumed my role as a CI for local colleges and regularly train physical therapist assistant students. Michael Devitt – I’m the owner of Focus Physical Therapy in Boise, Idaho. Kate Croxton – I married DJ Croxton in 2012. We recently moved back to his hometown of Bowling Green, Kentucky. I am currently working for S.T.A.R. Physical Therapy in Portland, Tennessee. April Fernandez – I have lived in Hawaii since 2013. I work as a contract civilian physical therapist for Joint Base Pearl Harbor–Hickam at an outpatient orthopedic clinic, where I serve active-duty U.S. Air Force members. Later this year, I will marry Nick Bronowski, who is also an alum. He works part time at a skilled nursing facility and at an outpatient orthopedics clinic. Yasuo Irie – I’m working at a general hospital. Michele Modugno – Since graduation, I have worked in both outpatient and skilled nursing settings. I currently work in a skilled nursing facility. I married in May 2012 and had a baby boy in November 2013. Christine Sullivan – I wrote my first textbook chapter, “Professional Presentation,” which was published in the second edition of Occupational Therapy Essentials for Clinical Competence (Slack Incorporated, 2014). Jane Munoz – I passed the board certification for Geriatric Certified Specialist in 2014. Brandon Bishop – I currently manage an awesome outpatient orthopaedic clinic in Las Vegas. I see something new almost every day and love it! Cristine Drake – I currently work at the Palm Beach Neuroscience Institute. 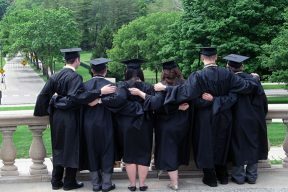 I landed my dream job six months after graduating. My goal is to become the leader in neurological rehabilitation in the Palm Beach area. I am working on a stroke specialty. Wish me luck! Adam Gresh – I am working as a physical therapist at U.S. Athletic Training Center, a sports-based outpatient orthopaedic clinic in New York City. Kyan Sahba – I’m currently working as a pediatric physical therapist in Los Angeles. I enjoy volunteering my knowledge of physical therapy around the world and have been to Nicaragua and Ireland. I hope to make it to Uganda or China next year. Scott Toronto – Since graduation, I worked in an out-patient orthopaedic setting in Idaho. I am currently working at Wright Physical Therapy in Twin Falls. I love the access we have to the outdoors and enjoy spending time with my family. Morgan White – We welcomed our son, John Allen, in March! He has been such a blessing! He keeps us on our toes, and he is the highlight of my day when I come home from work. Justin Bickford – I am currently working in an out-patient orthopaedic clinic in Texas. I started a manual physical therapy fellowship this summer. Matthew Guthrie – I work at an outpatient orthopaedic clinic called Silver Creek Fitness and Physical Therapy. We treat all ages and various injuries. I also work with the nonprofit Santa Clara Vanguard Drum and Bugle Corps to prevent and treat injuries. I got married in April. Anna Sidd – I am employed through CompHealth as a travelling physical therapist. I previously worked as a home health therapist in Madison, Wisconsin. Ashleigh Lyman – I work in outpatient orthopedics at a private practice in Solana Beach, California. I have recently completed my Certification in Applied Functional Science (CAFS). We are proud to announce that 100% of USA’s Fellowship Residency graduates who took the OCS exam this year passed their certification as Orthopaedic Clinical Specialists! Please join us in congratulating the following therapists for their hard work: Elizabeth Bergman, Christopher Baracco, Ryan Hill, Adham Rashwan, and John Russell.